HURRICANE — The Snow Canyon Lady Warriors softball team capitalized on a few untimely Hurricane miscues to defeat the Lady Tigers at Hurricane Tuesday afternoon, 10-3. Both teams’ pitchers went the distance and had strong outings, with Snow Canyon’s Payten Jensen striking out 11 batters and giving up seven hits and Hurricane freshman hurler Chantelle Pearson striking out nine and giving up 10 hits. Neither team scored in the first inning. 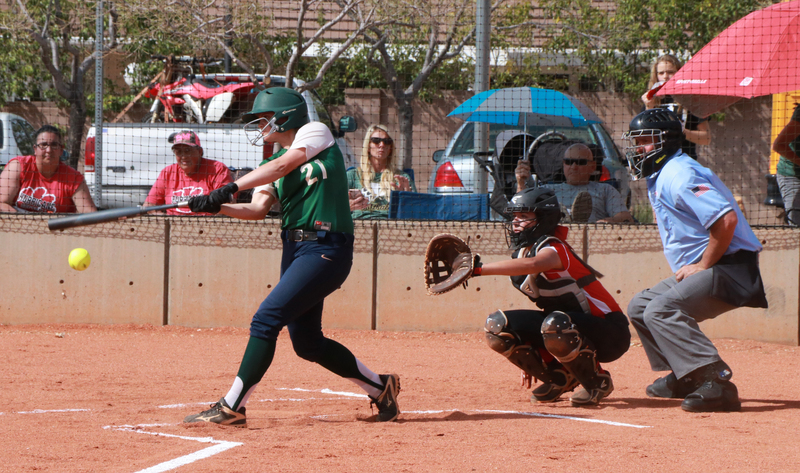 Hurricane freshman Haven Smith walked to reach first base but was subsequently thrown out while attempting to steal second by Snow Canyon catcher Kambrie Stewart. Jensen struck out both of the Lady Tigers’ other two batters in the bottom of the first. In the top of the second, Snow Canyon’s first two batters, Sydney McCaul and McKenna Staheli, both walked, after which McCaul was nearly caught off base during a steal attempt. However, the catcher’s throw to second base ended up going into center field, and both runners ended up scoring, giving the Warriors an early 2-0 lead. Hurricane was unable to get a runner on base in either the second or third innings, as Jensen struck out three and two Tigers grounded out to the infield. 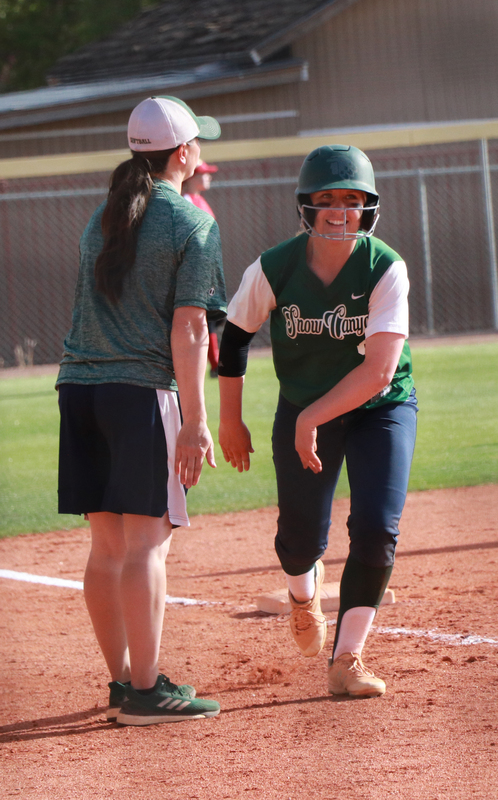 Snow Canyon scored four more runs in the top of the fourth to take a 6-0 lead, thanks to RBI singles by Alex Deming, Natalie Gunn and Marley Moala. In the bottom of the fourth, Hurricane broke the shutout when three of its first four batters all got base hits. Hannah Thompson hit an infield single on the first pitch of the inning, after which Smith struck out. Then, Mellina Madsen singled down the right field line, after which Mesa Jones belted a triple to right, scoring both Thompson and Madsen. Jones crossed the plate a short time later when lefty Charley Landis hit a double to left field. Hurricane’s rally ended with a strikeout with two runners on and the Tigers still trailing 6-3. Jensen, a sophomore, said it wasn’t until Snow Canyon scored a few more insurance runs late in the game that she was able to breathe a little easier. Snow Canyon’s lone run in the fifth came on an unusual turn of events, with Staheli striking out in what should have been the third out, but advancing to first base safely due to a passed ball. After stealing both second and third, Staheli scored on teammate Stewart’s single. In the sixth inning, Gunn fired a solo home run over the left-field fence. Moala and Emma Bingham also each scored a run as the Warriors extended their lead to 10-3. Hurricane committed four fielding errors during the game, along with a few additional throwing errors and passed balls that Snow Canyon managed to capitalize on by advancing extra bases. Hurricane dropped to 2-3 in region play with the loss, tying them with Canyon View, which is also 2-3 after losing at home to Desert Hills Tuesday. Hurricane and Canyon View still have to make up a previously rained-out contest with each other. That game has been rescheduled for May 8. The other five Region 9 teams have each played six games at the season’s midway point, with six more left to play. Hurricane’s next game is at Desert Hills on Friday at 4 p.m., while Snow Canyon will play at Pine View that same afternoon. Snow Canyon is 4-2 in region play and in third place in the standings halfway through the regular season. Snow Canyon also split a pair of non-region games in Payson over the weekend at an invitational tournament, losing to Spanish Fork 17-2 but beating Westlake 8-0. At Canyon View High in Cedar City Tuesday, the Desert Hills Lady Thunder belted total 13 hits in a 12-2 victory over the Lady Falcons in five innings. Addi Betts and Tori Hinton each had two hits and three RBIs to lead the way for Desert Hills. One of Betts’ hits was a home run. Senior pitcher Brianna St. Clair had a solid outing, throwing all five innings for Desert Hills and giving up three hits while striking out five. Desert Hills, which improved to 5-1 in Region 9 play, next hosts Hurricane at 4 p.m. Friday. Canyon View is now 2-3 in region play and tied with Hurricane for fourth place in the region standings. The Lady Falcons’ next region game is April 17 at Hurricane.